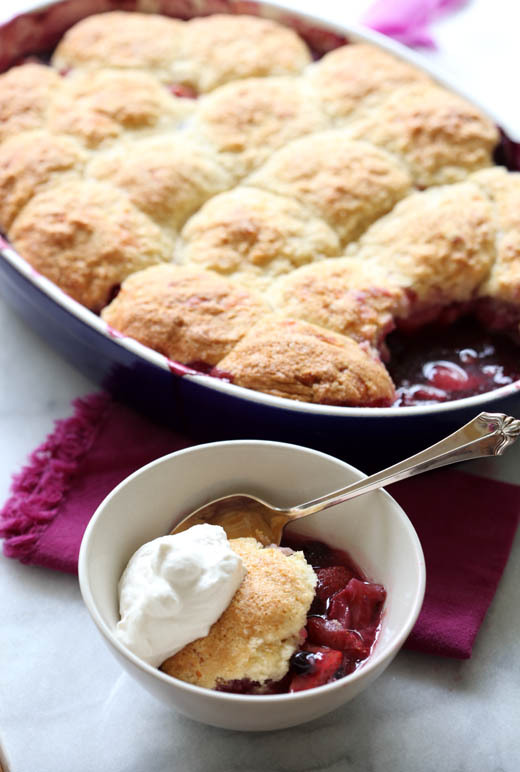 Berry Cobbler – A Happy Accident with Cheddar Biscuits! I have to admit this recipe was an accident, a happy one, but a mistake nonetheless. I was going to post on shortcakes, with balsamic roasted strawberries. I was mixing up the biscuits and got distracted, probably by something I read on Twitter. I added way too much buttermilk to the dough and they were no longer useful as biscuits. How disappointing to have a recipe in mind and then blow it. These weren’t just any biscuits, they were made with cheddar cheese, so they would have a slight sharpness to them, which I find a perfect compliment to the sweet berry filling. What to do, there was no way I was tossing these beauties, but they were too soft to work with in the traditional way. Then it hit me, COBBLER. All the same ingredients, but baked together at one time, even better. I added blueberries, fresh ginger and lemon zest to the strawberries and topped it with my sticky biscuit dough. Thanks to my inability to focus yesterday, I have a new favorite dessert! Preheat oven to 325°F and position rack in bottom 1/3 of the oven. 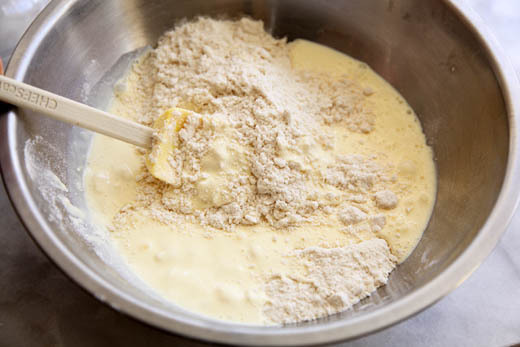 In a large bowl whisk together the flour, baking powder, baking soda, and salt. 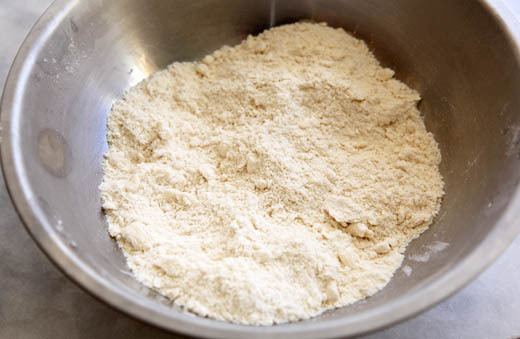 Cut the butter into 1/2-inch cubes and mix it into the flour using a Dough Blender or your fingers, until it resembles course cornmeal. Stir in the cheddar cheese. In a small bowl combine the egg, cream, and buttermilk. Add this to the flour mixture and stir just until there is no more visible flour, but it should still be sticky and lumpy. 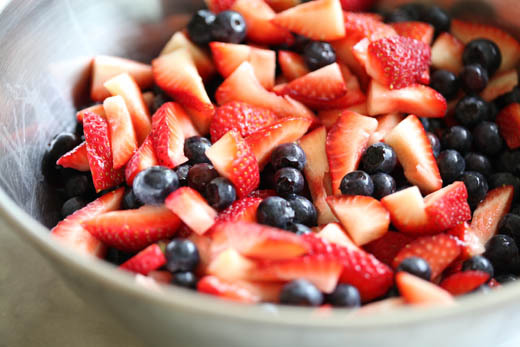 In another large bowl gently toss together the berries, zest, ginger, salt, sugar, and cornstarch. 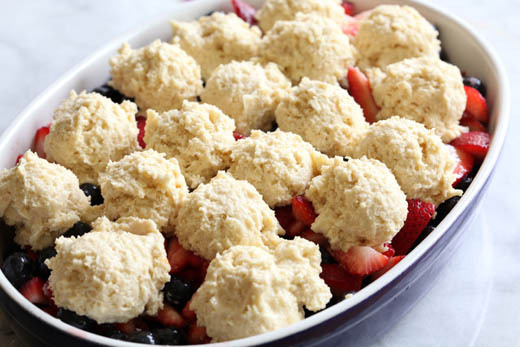 Place the berries in a shallow 10-cup baking dish. 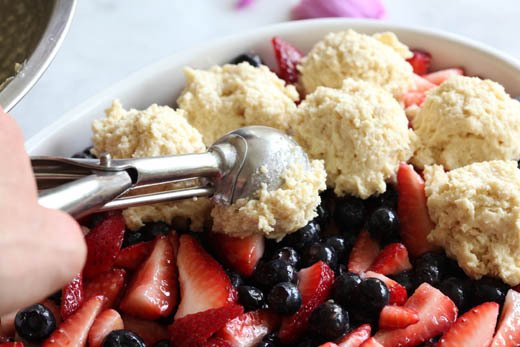 Scoop the biscuits evenly over the berries. They will be about golf ball sized scoops. Bake for about 1 hour and 15 minutes, or until the biscuits are golden brown, baked through, and the berries have been bubbling for about 20 minutes. 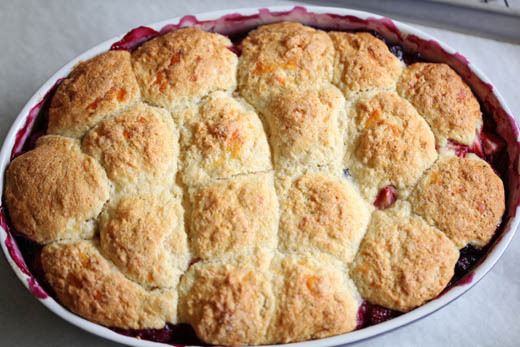 It is best to bake this on a cookie sheet in case the berry juices bubble out of the pan. Serve warm or room temperature with whipped cream or ice cream, I suggest homemade strawberry! What a wonderful mistake! I’m so happy that you were able to salvage it into something just as, if not more, delicious and beautiful. Thank you so much again for your advice on camera lenses! 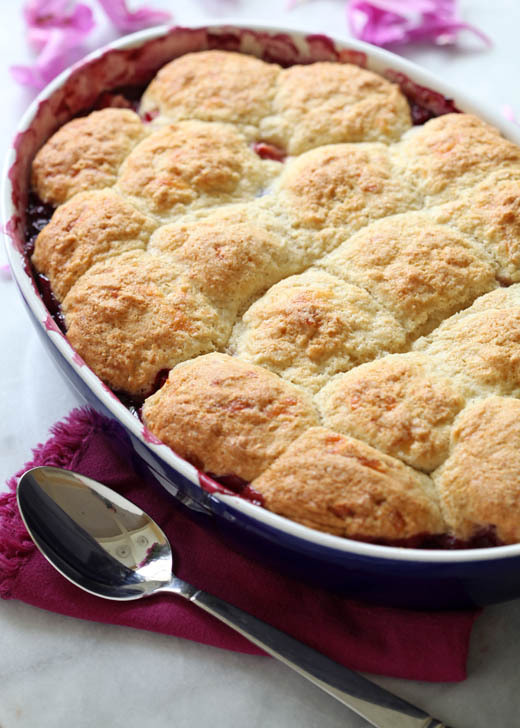 This cobbler is a sensation, truly! I cannot wait to try it out! I also love the combination of fruit and Parmesan! I can only imagine how great it must be with cheddar! How lovely! Sometimes these things are just meant to be, I guess. The cobbler came out beautiful and the flavors sound amazing! Gorgeous! I hope I can get to the point where I am versatile like that. Not yet, but working on it! made this!!! love the recipe, i used raspberries/marionberries and blueberry combi, these berries i mentioned, can`t find them sold in bulk at supermarkets here, the last time we went to COSTCO, i found these berries and i said to myself, why not buy them and find a recipe they can be useful, i searched everywhere in the internet and i stumbled on your recipe, glad i followed yours! thanks for sharing! Thanks for trying it, so glad you liked it! I also think that peach will be amazing! Artisan Pizza and Flatbread in Five Minutes a Day! Carrot Cupcakes – Plus a Decorating Set Giveaway!